I’m blogging again from Italy and again from the beautiful Grand Hotel A Villa Feltrinelli. The scene was so breathtaking and I knew I had to wear this fabulous floral maxi shorts jumpsuit from my boutique Morning Lavender for dinner one evening. I just love how flowy and comfortable this jumpsuit is and it was perfect on the dock, overlooking Lake Garda. Besides being the perfect outfit seaside, I also think it makes a great wedding guest outfit that really stands out! This dress was a part of our #CBLxML collection and sold out the first time. We just restocked it so make sure to get your hands on one this time! Thanks to my hubs for the amazing photography as usual! Ciao from Italy again! The hubs and I are still on our summer Eurotrip and thanks to our wifi hotspot, I’ve been able to document our adventures on the blog, Instagram and Snapchat (lacenlocks)! One of the best decisions we made so far on this trip was renting a car for our stay in beautiful Tuscany! With the car, we are able to see most of the gorgeous landscape and stop for spontaneous photos when stumbling upon breathtaking spots like this cypress tree road. For our travel, I knew I had to pack this lovely off the shoulder floral maxi dress which screamed summer with it’s bright yellow color, pretty floral pattern and trending off the shoulder style. I love how the dress stands out among the trees and how easy it is to wear for day or night. Traveling fashion for me is all about comfortability and versatility while still looking cute! Also it helps to bring non-bulky items, especially when traveling for an extended period of time! Hope you are enjoying our posts – more to come! The hubs and I are really blessed for the opportunity to shoot a beautiful wedding in Tuscany this weekend at the amazing venue La Foce! We are even more lucky to have jobs we love and travel together as the #huanderinghuangs! We went a few days early to do some location scouting, eat extra pasta/gelato and of course take in the beautiful scenery. I have been dying the find the gorgeous sunflower fields in Tuscany and happy to see they were in bloom right now. I put on this floral summer maxi dress and twirled away in the endless fields as we watched the sunset and my husband per usual, got some great shots! Stay tuned as I blog more of our Europe trip! Follow me on Instagram @laceandlocks and Snapchat @lacenlocks where I will be sharing more of our trip regularly! During the past several months, the Morning Lavender team and I have been working with the amazingly stylish and hilarious Kathleen of Carrie Bradshaw Lied. We wanted to start a series of curated collections for Morning Lavender featuring some of our favorite fashionistas that would represent our brand well. Kathleen was one of our favorite bloggers from the beginning and her engaging personality made it even more enjoyable collaboration! We had a blast during our Palm Springs Lookbook shoot! This outfit here is one of my favorites from our #CBLxML collaboration. I love that it looks like a maxi dress but it’s really a jumpsuit! The shorts make it super comfortable to wear and the flowiness of the maxi makes you feel so fabulous. As the owner of the boutique, I wish that every item we carry fits me well, but sadly (or as my husband says gladly) I am very petite and not all styles are made for petite gals like myself. This particular maxi jumpsuit has an elastic waist so I feel like it stretches for your body and the cut makes it flattering on just about everyone. I rounded up some of my other petite-friendly styles from our #CBLxML collaboration below. I’m working on bringing more of them to Morning Lavender! Hurry though – some of the items are already selling out! I’m adding some color to my Spring wardrobe with this gorgeous colorblock maxi dress. I am absolutely in love with the mix of shades of blue, pink and white in this beautiful dress as well as the lovely pleating. I wear mostly Petite sizing from ASOS but with the adjustable straps in this dress, I was able to wear the length on this dress without any alterations! 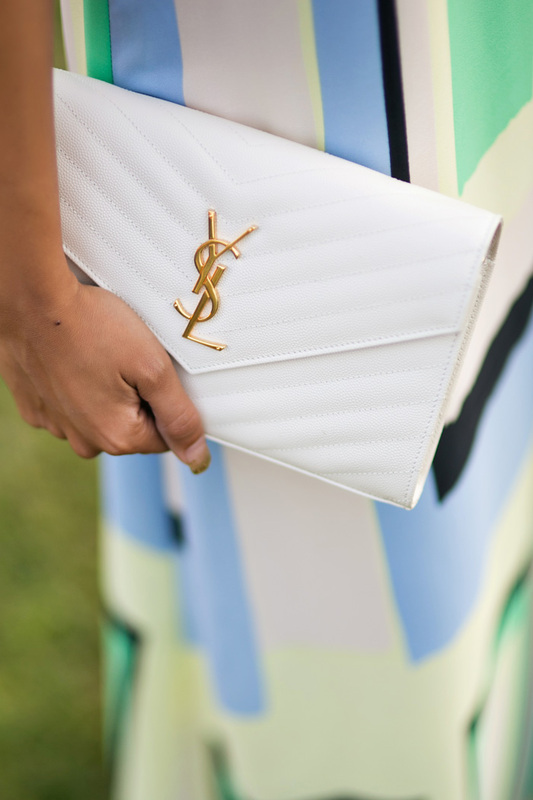 By dressing up this look with the right accessories, it’s perfect to wear to Spring/Summer weddings. With Spring and wedding season almost here, I’m starting to look for pretty dresses for various occasions. 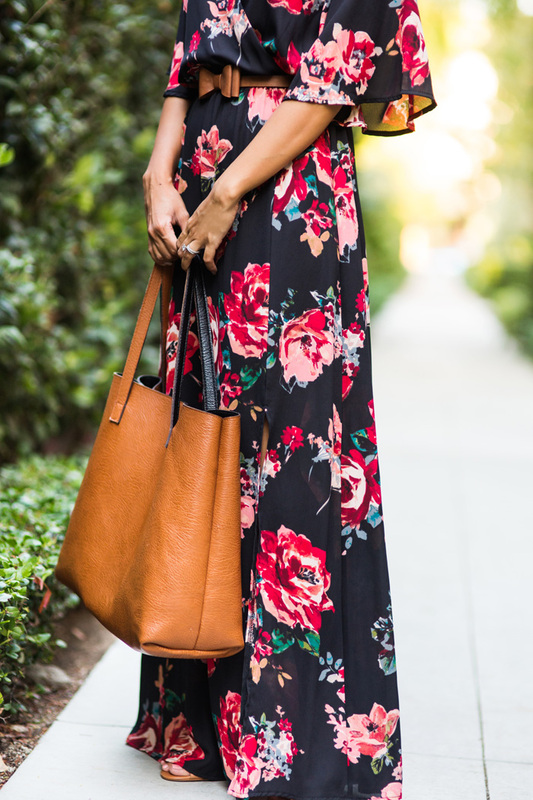 I’m a big fan of maxi dresses and this pleated pink floral maxi dress has all the right amounts of pretty! I am obsessed with the pleats and long, flutter sleeves. I just got the dress so I might alter it 1-2 inches since it didn’t come in a petite size. I still had to get it though since it was so darn pretty! I paired the dress with one of my favorite shoe trends going on right now caged heels. It’s a great alternative to your typical strappy shoe and I think it still looks classic but trendy at the same time. I’ll be on the lookout for more pretty occasion dresses so stay tuned! I hope you don’t mind that I share items from my Morning Lavender Boutique quite often! After all I started the shop because I felt a need for a shop that had all of the feminine and chic pieces that I wanted at affordable prices so why not share some of my favorite finds?! 🙂 This has been one of my favorite fall pieces that I hand picked for Morning Lavender – a maxi dress with sleeves that is feminine and has beautiful fall colors! I also love the side slit and the fact that I didn’t have to alter the length one bit (just add 4 inch heels). Can I just talk about how much I love this dress from Chicwish?! It’s just so light, flowy and pretty! It actually comes with a tie on sash for your waist for a more fitted look but I decided to wear it more loose and flowy for a swing dress type of look. I don’t think you can go wrong either way. And did I mention the dress is on sale for $62?! Gotta love online shopping! Clutch – Old Ted Baker find similar HERE, HERE and my favorite HERE. This colorful maxi dress from Anthropologie makes me smile. I love the blend of blues, yellows and greens in a bold, printed pattern. The dress hangs effortlessly, making it easy and comfortable to wear – perfect for the warm summer days and nights! It’s been pretty gloomy here in SoCal but that hasn’t stopped me from dressing up for the Summer! I love wearing maxi dresses all year round, but I especially love wearing them in the Summer for all of the pretty prints and colors. I found this darling polka dot maxi dress from Ann Taylor and it is currently on SALE with other dresses and skirts for 40% OFF with code PRETTY40! I love the soft blue hue of this maxi and I love that I didn’t have it alter it a bit. Thanks for stopping by! The husband and I are off to a destination wedding today and we can’t wait to share photos! Follow me on Instagram to see all about our travels! Here are some of my other current dresses and skirts from ANN TAYLOR on SALE NOW!